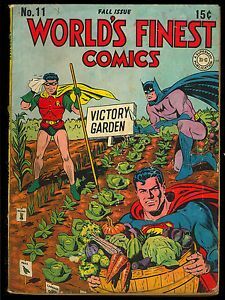 Being that Superman's 75th Anniversary is this year, I couldn't resist showing you this amazing comic book cover featuring a victory garden. Isn't it smashing?! Haha! I can't tell you how much I love it! 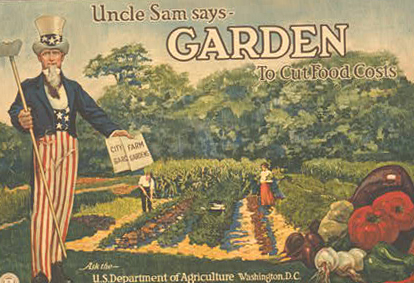 I've always been interested in reading about victory gardens during both of the world wars. What I love about it is that everyone everywhere, including children, was encouraged to grow a garden in whatever spare land was available - yards, empty lots, in community gardens, and at workplaces. One of my favorite wartime photos is of a man plowing up Old Main Hill on the campus of what is now Utah State University (my alma mater) for a victory garden. (see right) During WWI, Utah State University - then called Utah Agricultural College - was a land grant-based college focused on agriculture and funded heavily by the government. The college was asked to do its part, so, Old Main Hill was plowed up to grow crops for the war effort. I find that extremely compelling. Especially because I walked up and down that hill for 2 years! School children all over the country during both wars grew gardens, and even work places had "office gardens" where employees would all participate in caring for the garden. Gardening was a serious part of the war effort and literally tons of food was grown just from these little scraps of land here and there. This greatly contributed to lightening the agricultural responsibility in providing for not only the country's food needs, but those of the troops and the aid for allies overseas. In honor of victory gardens I wanted to make a recipe this week focusing on some produce from the garden. Since I just got the first tomatoes of the season off my tomato plants this past week, not to mention my first onion, I decided to try out this Tomato Aspic Salad recipe from my spiffy Lysol Victory Cook Book. I've always wanted to try my hand at making an aspic which uses unflavored gelatin. It's always fun to find different uses for gelatin! This is one of those recipes that I felt a bit of trepidation about. A jiggly mold of savory tomato doesn't sound too appetizing, but one of my goals when starting out on this project was to make some recipes that were out of my comfort zone. Believe me, this is one of them! The ingredients are quite simple: tomatoes (fresh or canned), a bay leaf, gelatin, cayenne pepper, lemon juice, cold water, onion, celery, and some lettuce to serve it on with mayo for a garnish. Combine the tomatoes, grated onion, minced celery, salt, cayenne pepper, and bay leaf and simmer for 10 minutes until tender. Sprinkle the gelatin over the cold water to soften. Return the tomato mixture to the heat and return to a boil. Add the gelatin and stir to dissolve. Add the lemon juice. Pour the mixture into 3 molds that have been chilled with cold water. Chill until set. Remove the aspics from the molds, sit them each on a bed of lettuce and garnish with mayo. Serves 3. Doesn't it look so iconic? The big moment of tasting came. I'll be honest. I was nervous, but I just went for it anyway and dug in. I got a spoonful of the aspic with a little dollop of mayo and... it wasn't bad! Not my favorite, but not bad. It packs a powerful, clean flavor punch. The wisdom of the '40s portion sizes never ceases to amaze me. I was worried they were too small, but I think considering the flavor density, the size is perfect. What a great way to get in your serving of veggies! The creaminess of the mayo is important for this salad to cut the acidity of the tomato. Also, it goes without saying, but you have to really like tomato to want to eat it! I was additionally happy to find that it did not remind me of fruit-flavored Jello at all. I think this would make a fun, retro appetizer for a dinner party. I mean, who wouldn't want to be able to say that they've had aspic? Haha! Holy smokes! USU! That picture is great!